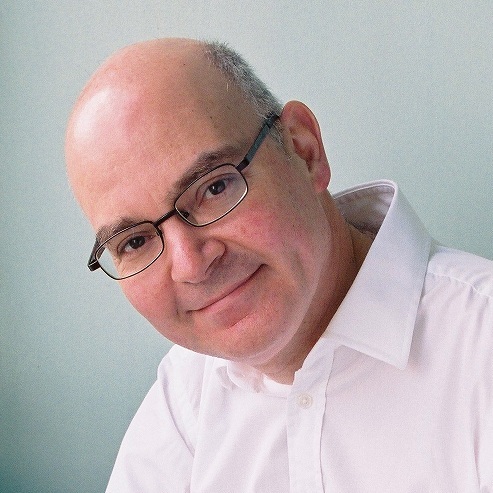 Author Paul Emmerson reflects on in-work and pre-experience Business English. What is Business English? A naïve question to be sure, but a good one to step back and ask from time to time. Below, in blue, is a nine-point answer to that question that I wrote along with my colleague Nick Hamilton back in 2000. It was going to be the Introduction to Five Minute Activities for Business English (CUP) but never made it into the book. You start with a Needs Analysis. The Needs Analysis leads on to a negotiated syllabus. There is no ‘main’ coursebook, although a selection of coursebook and other material may be used. The classroom tasks and texts are personalized, based around the interests and needs of those particular students. The syllabus is designed around communication skills (telephoning, meetings, presentations etc.) and business topics (management, marketing, finance etc. ), not the English verb tense system. Language work is more lexical, including collocation and functional language, and less grammatical than General English. Pronunciation is another important area, especially the ability to break up speech into appropriate phrases (phonological chunking) and to use stress to highlight key information. Teaching methodology includes much use of tasks, role-plays, discussions, presentations, case studies and simulated real-life business situations. Approaches and materials are mixed and matched, but there is unlikely to be a high proportion of conventional Present-Practice lessons where one grammar point provides the main thread of a lesson. Much language work is done diagnostically following speaking activities. Feedback slots are used for checking, correcting and developing language (Output->Reformulate rather than Input->Practice). There is use of a range of authentic and business material (magazine articles, off-air video, company documents). Delivery of the course is different: the students are ‘clients’ with high expectations, the teachers are professional ‘trainers’ (or perhaps even Language Consultants). Teachers and students sit together round a table like in a meeting rather than in the classic GE ‘U’ shape with the teacher at the front. Conversation across the table may develop its own dynamic far removed from the teacher’s lesson plan. While teachers are expected to be competent as Language Consultants, classroom managers etc. they are usually not expected to be business experts. This is a language course after all, not an MBA. However teachers are expected to have an interest in business, ask intelligent questions, and slowly develop their knowledge of the business world. Students studying BE in large groups in higher education – often called ‘pre-experience’ students because they have not yet started working. Students studying for a BE qualification (often pre-experience as well). Such students will almost certainly be following a coursebook, with tasks, texts and language focus already included. Students will be less interested in or unable to personalize activities. They might want to be taught about business itself as well as business English. Looking back eleven years later it still looks like a good definition. But the final paragraph – about pre-experience BE – needs a little more development. Back in those days I didn’t realize the simple fact that the overwhelming majority of BE students are indeed pre-experience. Publishers have certainly realized this: all major multi-level coursebooks that I know (except InCompany) are aimed squarely at pre-experience students. When was the last time you read a coursebook instruction that invited the student to talk about their own company/job? Were an author to include it in a first draft, the editor would quickly ask them to change it – seeing the largest market disappear before their eyes. So what can I add now about the pre-experience context? My own teaching these days is in-work students coming to the UK for short, intensive courses. In the past I did the classic freelance ‘in-company’ thing (from 1991 to 1996 – in Lisbon, Portugal). In Lisbon I did also do a little pre-experience teaching in the evenings, so it’s not unknown to me. Nowadays, I have contact with the pre-experience BE world not through teaching but through teacher training (TT) – the majority of my trainees teach in higher education establishments of various kinds. On the TT courses we spend a lot of time discussing how BE ideas can be applied to the pre-experience classroom. The table below is a short summary of the ideas that trainees most often contribute in discussion. Large classes are the norm. Small classes, or 1:1, are the norm. Mixed language levels is the norm. Language levels likely to be slightly more equal between students in the group. Students follow a coursebook most of the time. Students use a variety of input material from a variety of sources, perhaps collected together in a file. In many lessons the students draw ideas for discussion from their own world and there is no material (i.e. a dogme approach). Exam involved – course has to be designed around this. No exam involved – course designed around student’s needs (ongoing/changing). Lesson structure clear, coming directly from the coursebook. Lesson structure flexible and liable to change at any moment according to where the Ss take the lesson or how much they have to say. Ss want more of a GE style course with lively/fun topics for discussion. Ss want a strong business/work focus. They are often happy with dry, information-dense texts that a Pre-Exp student might find boring. T needs to think creatively about how to encourage pairwork, group work etc.Tip Pre-Exp Ss love case-studies, which they can do in small groups followed by your language feedback. Small class size allows more options for classroom management. For example, whole class activities are possible (discussions, RPs, presentations) and Ss will do them without being self-conscious. All previous points taken together mean that the T needs skills that are quite similar to a GE teacher, with a focus on classroom management of large, mixed-level groups. All previous points taken together mean that the T needs to be able to respond to the changing needs of the Ss in real time and act as a group facilitator and language consultant. Focus is often more on business topics than on business communication skills. Focus is often more on business communication skills (at least in most pre-course Needs Analyses I have seen, and in InCompany). Ss need models before they can do a communication activity: an example email, an example presentation, an example meeting etc. Less need for models – Ss have experience of emails, meetings etc. in their everyday lives. Few opportunities for personalization (Ss don’t have their own company), but they can draw on a) summer and part-time jobs, and b) work experience/internships. Personalization easy, necessary and important. T has to teach some business content (although remember that Ss are studying business in other classes). Ss already know about business – in fact they teach you about business. Ss accept what you say/teach. They don’t ask many questions and don’t challenge T or each other. They are young and T knows best. Ss question what you say/teach. They freely ask questions and challenge T and each other. Innovative approaches are tried and adopted more slowly, and usually only as they filter through to the classroom via coursebooks. Innovative approaches are tried and adopted more quickly (lexical approach, task-based learning, intercultural awareness, soft management skills, use of internet in the classroom, etc). Ss are adolescents/young adults and bring into class personal issues, parents’ expectations etc. Ss are more mature and tend to keep their personal lives out of class.Exception: one-to-one classes, where Ss often bring very personal things and you have to be a sympathetic listener/counsellor etc. How much do these teachers have in common? What unites them? What separates them? How much does it depend on the individual lesson? How important is the teaching context as given in the bullet points compared to the personality of the individual teacher and their own particular approach? Perhaps the four teachers in the bullet points are different tribes. Perhaps not: it might be that most BE teachers in the world are in a grey area somewhere between the pre-experience and in-work poles. So many pre-experience teachers are inclined towards one pole, but at the same time are trying valiantly to incorporate more in-work techniques. And many in-work teachers are inclined towards the other pole, but sometimes rely a little too heavily on published material (especially at the start of their teaching careers) without offering the students the chance for personalization. And of course every lesson is different. It’s also possible that there is a ‘silent majority’ tribe. At conferences and teacher training courses we only come into contact with the best, most motivated, and most open-minded teachers. They did decide to come after all, while their colleagues stayed at home. Perhaps those who stayed at home are just working through a coursebook, page by page and week by week, in difficult teaching situations, poorly paid and demotivated. Do they make a separate tribe in their own right? Paul Emmerson is a well-known figure in the Business English world. He is a writer, teacher and teacher-trainer based in Worthing on the south coast of England. To find out more visit http://www.paulemmerson.com/ or his new site http://www.beherebethere.com/ and view all of Paul’s recent ELT material. Use promotional code: BEHERE10 to receive 10% off his material. Fancy commenting on the final draft of a book section before it’s published? 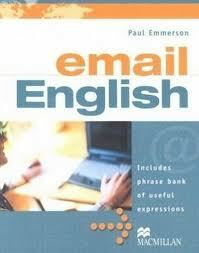 Paul Emmerson wants your input on his new supplement for his Macmillan coursebook Email English. This is a unique opportunity to take part in a crowd sourcing experiment in association with the IATEFL BESIG website. Paul Emmerson is currently writing a second edition of his Email English, which will have a 15-page Social Media supplement. Before giving the supplement to his editor, he is first inviting his readership to comment on his final draft. When you’ve had a chance to look at the material, you can leave your comments, by simply clicking on the “Comments” button at the top of the window on right. The deadline for comments is Sunday June 24th. About ten years ago I spent some time reading various books about cultural differences in business. I cannot now remember the titles and authors. I made a lot of notes. The document that I created that summarized the books has been sitting in my files ever since then and I have never done anything with it. I’ve now decided to present it here on my blog. Feel free to use it in any way that you choose, possibly as a student hand-out for discussion and comment, possibly just for your own consideration. I’ll post these notes in two instalments, with the second to follow next month. I am aware that international business culture is becoming more uniform, and that many individuals do not conform to these stereotypes. I am aware that when you take someone out of their country and put them into a team in another country, they often adapt quickly and lose their ‘national’ characteristics, at least to some extent, and at least for younger people. I am aware that company culture may be as important as national culture. I am aware that descriptions of national characteristics are really just subjective impressions with no firm evidence (Hofstede and Trompenaars notwithstanding). I am aware that the descriptions that follow in this document divide the world into three groups, and ignore differences within the groups. It makes you realize that your way is not the only way. It gives an initial orientation for what to expect when working internationally, and this alone is helpful. As you get to know the culture the broad stereotypes will disappear and you will see individual differences and form your own views. Unique individuals, independent and equal. Part of a family or religious group. Members of a large group: family, company, nation. Individual achievement, high salary, recognition for being creative. Status, honour, social recognition, reputation. Group success. America: action, success, openness, directness, equality, competition, independence, risk-taking. Europe: less materialistic, less risk-taking, more traditional. Family security, family harmony, relationships, authority, status. Group harmony, relationships, cooperation, honesty, loyalty, age/seniority, family security. Competition, innovation, quality, informality. Trust in individuals. Group harmony, long-term relationships, reputation of company, quality. Profit. People live to work. Security for family and prestige for head of family. People work to live. Market share and long-term opportunities for company. Friendly and informal, but a continuing personal relationship with individuals is not important. Much business is done over the phone. Personal relationships are very important. A long time is needed to build trust before business can begin. Preference for doing business face-to-face. Based on mutual respect. Relationships with individuals are important, but business is done on a group basis. Often there is an older authority figure who seldom appears but has ultimate power. In Japan, socializing after work is seen as an important part of the relationship. America: hard sell, with slogans, clichés, exaggeration, tough talk and wisecracks. Europe: reason and soft sell. Time needed to study other individuals. Reserved. Like lots of opportunity to ask questions. Decisions are like contracts and people are under an obligation to stick to them. If the situation changes, the decision might also have to change. If the situation changes, the decision might also have to change. Making a deal or decision. Formulating a plan of action. Establishing relationships and building rapport. Clarifying and issuing instructions. Information gathering. Decisions emerge over long time period. Punctuality important. It shows a desire to use time efficiently (particularly Switzerland and Germany). In Latin cultures people might take a more relaxed attitude to time, and being 5 or 10 minutes late is acceptable. Time is very important to the Chinese, who apologize for taking up time and thank others for their time. Senior person sits at head of the table, others sit fairly randomly. If there are two ‘sides’ they sit face-to-face. Senior person in place of obvious importance, others often arranged by status/age. Two ‘sides’ may sit next to each other. Pre-arranged, with members often sitting in order of rank. Guests will be shown where to sit. Two ‘sides’ may sit so that you face a person of equal rank across the table. Direct eye contact shows sincerity and equality. Direct eye contact shows sincerity and trust. Direct eye contact rarely used – it is seen as intrusive. A smile shows lack of understanding. Americans, Germans and Scandinavians get down to business quickly. Considered rude to start talking business until some small talk has been exchanged. People’s opening comments are addressed to the senior person, who often speaks first. In Japan, there is a long ritual of thanking the visitors. People’s opening comments are addressed to the senior person, who often speaks last. Americans: direct, factual, informal and at times confrontational. French: oratorical with abstract logical arguments. Germans: require full information and context. British: use humour and try to be reasonable. In Arab culture distractions during a meeting are normal. The host may be talking to several people about different topics at the same time. Preferred style is ‘monologue – pause – reflection – monologue’ rather than dialogue. Arguments are often indirect. Periods of silence show respect and allow time for consideration. Keep to the agenda. Treat agenda more flexibly, returning to previous items or digressing. In Arab cultures there is often no clear agenda In Japan the meeting has clear phases: opening ritual, outline of agenda, less formal expression of views, non-confrontational replies, formal summary. Participants bring up disagreements quickly, openly and directly. Americans, Germans and Australians are particularly frank. English are indirect. French are rational and precise. Latins are direct, but the Portuguese and Chileans are considered more diplomatic. In Arab culture disagreement is often shown by silence. Public disagreement is very rare because criticism means the other person losing face. More subtle techniques are used, including questions that express doubt, remaining silent, or ‘Yes, but …’. Serious issues are addressed privately, outside the meeting. The Japanese in particular value harmony very highly. Koreans are more direct. Decisions are based on facts, and are often made instantly in the meeting. During the meeting positions can change. Decisions are made by key individuals, outside the meeting. Positions are relatively fixed in the meeting, but are subject to rapid change outside the meeting. No rush to make decisions. Decisions are made by group consensus over a longer time period. ‘Yes’ often means ‘I understand’ rather than ‘I agree’. There are no sudden changes of viewpoint in meetings. Plan of action, delegation of responsibility, review of tasks to be done. Reference to continuing relationship. Formal thanks. Reference to long-term relationship. Typically 2-3 people involved. Team members constant throughout process. Typically 4-6 people involved. Senior person involved at beginning, junior/technical staff take over later. Senior person comes back to close the deal. Typically 4-7 people involved. Team members may rotate. Pragmatic view of negotiation – little consideration given to social aspects. Little understanding of nuances of protocol, status, connections and respect. Sit facing each other and maintain eye contact while talking. Negotiation is a social ceremony with important considerations of venue, hospitality, protocol, timescale and courtesy of discussion. Seating shows status of individuals. Maintain eye contact while talking. Negotiation is a social ceremony. Seating displays harmonious relationship – often a circular arrangement. The Japanese sit side by side and stare at a common point, giving sideways glances to their opposite numbers. Little time spent on building rapport – the deal comes before personal feeling, particularly in America. Little room for sentimentality. Personal relationships are very important for doing business, and a long time is spent on building trust. In S. America it is important to spend time establishing respect for national characteristics. Building rapport and group harmony is necessary before business can be discussed. Respect for the company is important. Long time frame is used to check sincerity of other side. Logical, step-by-step approach. Early focus on price. Much use of written documentation. All elements of negotiation are constantly available for change. Price discussed towards end. Extensive asking for and checking of information. Focus on explaining, justifying and evaluating. Saving and/or making money. Facts and figures. Loss of opportunity unless you act soon. Concessions are asked for and given in a rapid, linear process. Hospitality and personal relationship. In Middle East a go-between is often used to avoid face-to-face conflict. Long-term relationship more important than the individual deal. No-one must lose face, so open negotiating in a meeting is unacceptable. America language is open, direct and urgent. Confrontation is seen as being necessary for progress. No personal honour is at stake. The English like a calm, reasonable discussion where confrontation is avoided. Germans are very thorough. The French are logical and rational. In Use of expressive and emotional language. Respect for dignity of others. Grand outlines rather than details. Latins like to have something to win, and their own concessions must not appear too much like concessions. In Middle East religious references (God’s will) may be made. In Japan, language is indirect, appreciative and cooperative. Respect for dignity of others is very important. No-one must lose face in the meeting. Within 5-10% of expected outcome. Within 10-20% of expected outcome. In Middle East, within 20-50%. Within 10-20% of expected outcome. Add to package, sweeten the deal with more favourable payment terms etc. Further concessions on price. Few further concessions and little continued bargaining. Top management team make decisions. Short time scale. In America there is high tolerance of risk. It is calculated, and is the personal responsibility of an individual. Feelings and intuition of senior individuals are important. Long time scale. In the Middle East never push for a decision or criticize anyone for the way business is conducted. Middle managers make a collective decision. Long process until consensus is achieved. Low tolerance of risk. Group responsibility. Paul Emmerson is a well-known figure in the Business English world. He is a writer, teacher and teacher-trainer based in Worthing on the south coast of England. 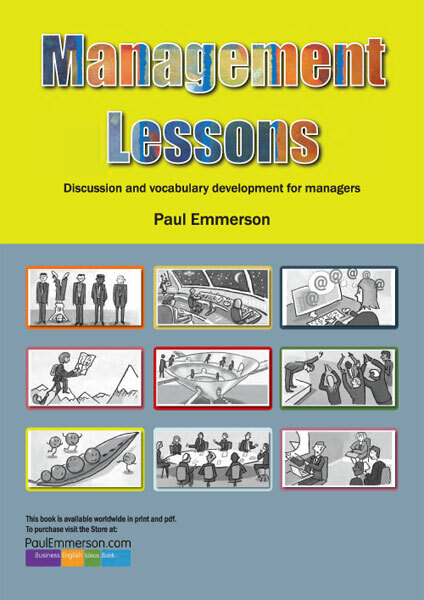 His most recent book, Management Lessons, is a photocopiable resource book for teachers of Business English, available from BEBC. To find out more visit http://www.paulemmerson.com/.